Isaac Julien’s 2004 work Encore II (Radioactive) is a short film study inspired by a character from the writings of Octavia Butler, an African American Science Fiction writer, best known for her recurring exploration of genetic manipulation, contamination and hybridity. The film re-digitises footage shot in Iceland and northern Sweden from Julien’s film True North (2004), a work based on the story of African-American explorer Matthew Henson, one of the key members of Robert E. Peary's 1909 Arctic expedition, and arguably the first individual to reach the North Pole. In Encore II: (Radioactive), the protagonist is recast as a cyborg played by Vanessa Myrie. Using super-8 footage from Julien’s earlier video experiments which were shot in 1980, whilst he was studying at St. Martin’s School of Art, the film manipulates the Icelandic landscape and its surroundings, imbuing them with a visual and sonic electronic aura that dislocates the setting from a specific time and place. Julien first garnered a cult following worldwide after the release of his critically acclaimed documentary drama Looking for Langston exploring the life of Langston Hughes and the Harlem Renaissance; while his debut feature film, Young Soul Rebels won the Semaine de la Critique prize at the Cannes Film Festival. His recent work, Ten Thousand Waves premiered at the 2010 Sydney Biennale and went on to be exhibited worldwide, including at the Museum of Modern Art, New York, and the Fondation Louis Vuitton, Paris. 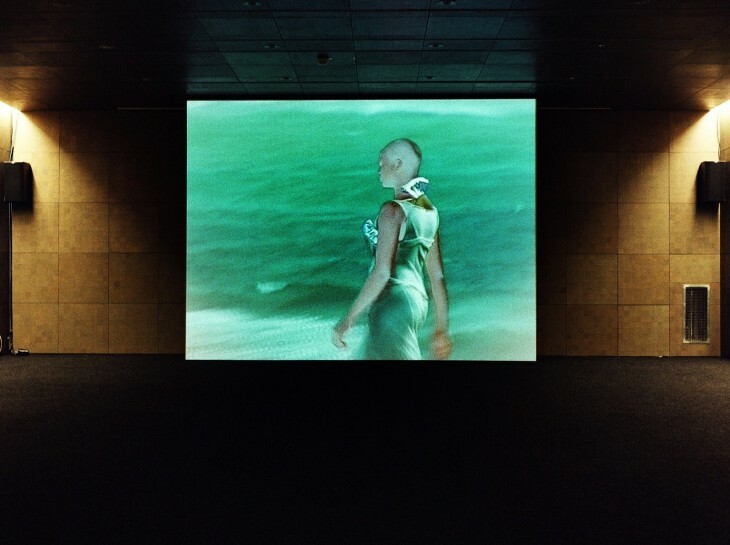 Image: Installation-view of Isaac Julien's Encore II: Radioactive, exhibited in 3', Central Gallery of Contemporary Art, La Coruña, Spain, 2005. © Isaac Julien.